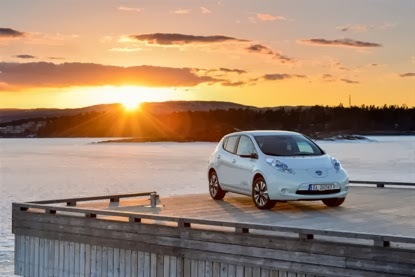 The Nissan Leaf has for the first time claimed the number one spot in Norway's passenger car sales chart. In October, the zero emission family car out sold all of its internal combustion engine, hybrid and electric rivals, taking almost 6% of the total passenger vehicle market. Nissan's second generation LEAF, which was launched earlier in the year, continues to lead the way in zero emission mobility. The Nissan LEAF consistently performs outstandingly in the Norwegian market, the undisputed electric car capital of the world, taking fourth in the sales charts for 2013 to date with over 3% of the market. Jean-Pierre Diernaz, Nissan Europe Director of Electric Vehicles, is delighted with the latest Norwegian success, commenting: "We have had incredibly strong sales this year in Norway and with the introduction of the new Nissan LEAF in the middle of 2013, we have seen that level not just maintained, but exceeded. To get the number one spot is an extraordinary sales performance, even for the world's best selling electric car, but to be number four in the charts for 2013 so far is something we are incredibly proud of. We continue to be successful in the main Norwegian cities, but the majority of our growth is coming from rural areas, which shows is the breadth of the Nissan LEAF's appeal." Jacek Gorski, Nissan Nordic Europe Managing Director believes the success is because the car fits Norwegian customers' needs, commenting: "It is no surprise that we are beating even our April record of second position with the new Nissan LEAF, we knew that that latest version was an even better fit to the Norwegian lifestyle. The increased boot capacity, five seats and standard quick charging make it a great family car. In addition, our engineers have designed a Nordic pack including battery heater, just for the Nordic region, to maintain customer satisfaction even in our very cold winters."